Start the New Year out right with a Giveaway! 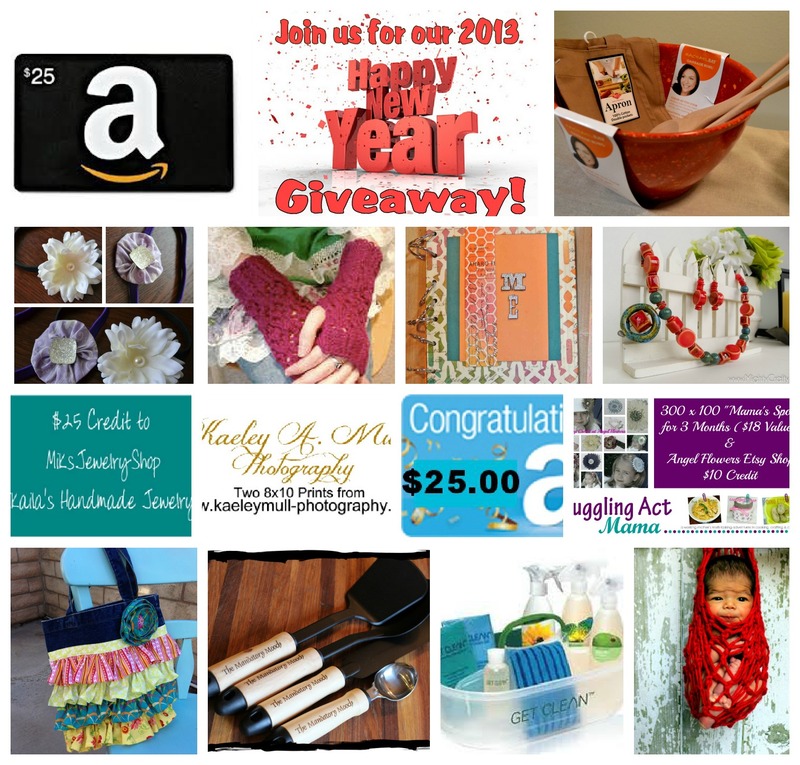 We are ringing in the New Year with a fantastic giveaway! One lucky person will win all 14 great prizes valued at over $350 These prizes were contributed by the sponsers below. We would like to wish you all a very healthy, happy and prosperous New Year! Here are the prizes. More info about them in the giveaway below! It may take a minute for the contest to load. Thanks for the great giveaway. I hope you had a wonderful Christmas and I pray you have an abundance of blessings in 2013! Burnt Apple had no like button on FB, and the link in the rafflecopter is broken, so I found it and sent a friend request...can't like someone who doesn't have a like button. Thanks. Thank you Carla, a friend request is perfect! It has been fixed. I hope you can come back and add the other entries. Shoot I missed the link up but I entered the giveaway!! Thank you for hosting! Thanks for following & commenting on my blog! I followed back! Happy New Years! what a great giveaway! if the rafflecopter thing loads for me i'll enter! stopping by from the grow your blog blog hop! thanks for sharing! Great blog and awesome giveaway! Shopping by from the aloha blog hop! You are very welcome Kathy. Glad you stopped by! What a great blog, Happy 2013 and thanks for the fabulous giveaway. What a great Giveaway! Thanks for sharing. Thanks to all of you that participated in the giveaway. I wish you all could have won!